17-minute demonstrations started at 10 a.m.
Students across the country walked out of classes Wednesday morning to mark the one-month anniversary of the school shooting that killed 17 in Parkland, Florida. About two dozen Tri-State schools confirmed to WCPO that they allowed students to participate in the national walkout, but there were likely numerous others. At La Salle High School, officials said students planned to instead pray during the national walkout. "If something happens in a tragic way to someone else, we feel that pain and we pray for those people whether we know them or not," La Salle principal Aaron Marshall said. The walkouts were scheduled to last 17 minutes — one minute for each of the 17 victims in the Florida shooting — starting at 10 a.m. The group organizing the walkouts is calling on lawmakers "to keep us safe and pass federal gun reform legislation that address the public health crisis of gun violence." MORE: Can students be punished for walking out of class in support of gun control? Students at some local high schools already held walkouts last month following the Parkland shooting. Since Simon Kenton High School students already walked out then, they plan to demonstrate inside the school this time with a moment of silence and writing letters to victims' families and state lawmakers, a school spokesperson said. Students at Walnut Hills High School also walked out again on Wednesday. 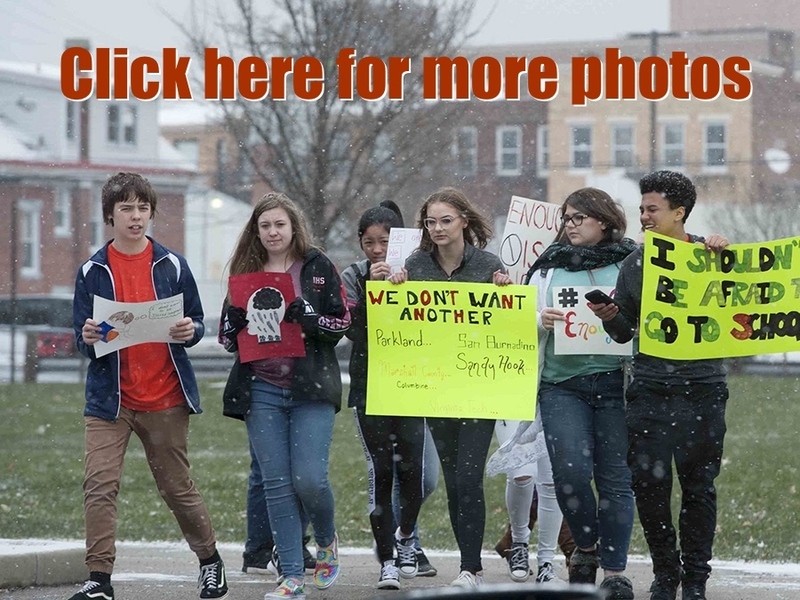 Other schools hosting walkouts included the School for Creative and Performing Arts, Sycamore, Forest Hills, Aiken, Dater, Newport and Bellevue high schools. Kenton County students demonstrated inside the school with a moment of silence and wrote letters to the victims' families. Signs around Dixie Heights High School read "Reach Out" instead of walkout as a way to encourage students to be kind to one another. Many school officials said that students who chose to participate in the walkout would still be responsible for work missed during that time, but they wouldn't face any disciplinary action. Students from around Greater Cincinnati are planning another demonstration for April 20. They'll march from Washington Park in Over-the-Rhine to the steps of City Hall on Plum Street Downtown to call for stricter gun laws and help for people with mental illness.